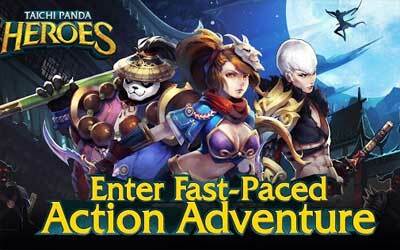 Taichi Panda: Heroes APK is updated to the latest version 1.5. It is new sequel from snail developer. In this sequel, there are some improvements in the quality of graphics, music and its features. There are some new features which are not available in the old version, but the “original” content that exist in the older version is still available in the latest version. Still using slash-fast-pace-combat gameplay that is widely applied in other MMORPG games. Thing that changed is the graphics, become more beautiful, so fighting in the game between you and your enemies will become more appealing to the eye. Not only improving the quality of the graphics, snail also provides very important features in this game, open world features, players can explore the wide map in the game. As the name Taichi Panda Heroes, snail also make more prominent heroes in this game. It has 19 heroes with various abilities and strengths that are unique and different. And listed 19 heroes, there are still the old heroes from its old version, so for you who play Taichi Panda 1 you will be familiar with the heroes. Another new feature is you can bring other heroes to come into your fight. Heroes will be controlled by AI, it would definitely help the heroes once in the fight. PvP is still presented in this game. With large enough scale. PvP features will comfort you when bored in the missions. Collect and manage your band of legendary champions to discover exciting action and intriguing adventure in online open world RPG sensation! Game has so much to offer. Amazing gfx, amazing gameplay. Amazing characters! Keep it up!